The Universal Rights Group (URG), in cooperation with the Centre for Rights and Justice at the Chinese University of Hong Kong and Mazars, last month helped launch the Economist Intelligence Unit’s (EIU) report on The road from principles to practice: today’s challenges for business in respecting human rights. 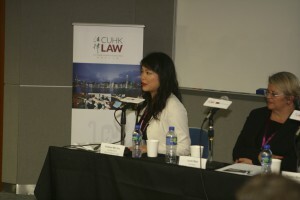 This was the first event organised by the URG in Asia, at its Hong Kong hub. URG’s Asia hub is located at the Chinese University of Hong Kong. The event attracted a crowd of over 180 attendees, which included consulate generals, civil servants, CEOs of multinationals, financial and professional services executives, NGO leaders, media representatives, academics and students. As an expert on international employment law and former consultant to the International Labour Organization’s offices in Asia, Professor Zou posed the question of how businesses can move towards a ‘Race to the Top’ in the area of labour rights for the 1 billion workers in Asia. She argued that multinational businesses across different sectors have faced various challenges in addressing so-called ‘sweatshop’ working conditions in Asia, especially in the ever-growing complexity of global supply chains. In recent years, the tragedies of FoxConn worker suicides and the collapse of the Rana Plaza factory have illustrated the continued difficulties that multinational businesses face in their oversight of suppliers’ practices, especially where state governance is weak and local enforcement of laws is poor. To move from principle to practice, Professor Zou highlighted a number of fundamental ILO rights at work that all businesses should respect. These include: workers’ freedom to associate and organise and their freedom to bargain collectively, the elimination of all forms of forced or compulsory labour, the effective abolition of child labour and the elimination of discrimination in respect of employment and occupation. Professor Zou also propose the need for workers to be involved in developing, shaping and implementing the human rights policies of businesses, which point to the importance of workplace dialogue and employee involvement in business decision-making across all levels. Current leaders in corporate action on human rights have moved ahead by embedding respect for human rights within their organisations, but acknowledge that they still have much to learn.